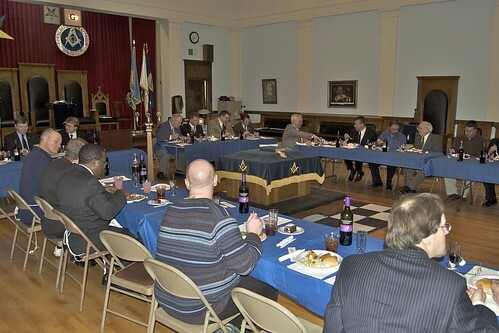 1st degree plus a Table Lodge plus Grand Lodge Officers Equals Awesome. Last night, Corinthian Lodge No. 67 did something that it has never done in its 142 year history, a table lodge/ 1st degree. We initiated four brothers into our Fraternity. But that wasn’t the only exciting event to hit the Lodge, we were also fortunate enough to host the Grand Master, the Deputy Grand Master, and the immediate Past Grand Master and to quote Craig Ferguson, "Whaaaat?! I know." When I was installed as Master, I had decided to do something different, something new. It’s not that Corinthian has been hurting for candidates or a general sense of malaise has hit widespread. It’s just that I saw a pressing need to keep us relevant, to recognize that we, as a Lodge, must view what we do as a progressive science. We now do degree work on a scheduled basis, spacing them at about a month apart while giving an educational piece in between so that the lessons are better understood. We also used a seven toast Table Lodge in the 1st degree. This event and program was truly enjoyable and I am so fortunate to have these hard working brothers with me. Our Junior Warden Joel and the Stewards, Dan and Art, really outdid themselves, offering a wonderful meal to all brethren assembled. 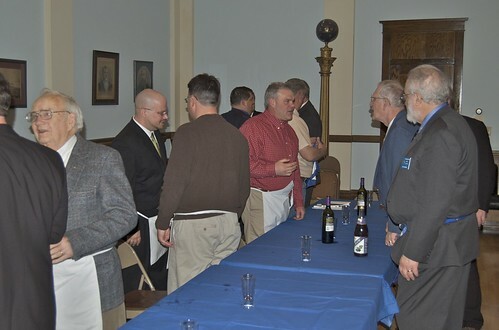 As we began the meal, I saw the excitement and joy in the faces of our candidates, in our visiting brethren and the members of our Lodge. I was also very happy to see our newest Master Mason, Bro. John, at this meeting, where he was presented with his apron and Bible by WBro. Hugh in a beautiful presentation which I was told is unique at Corinthian Lodge No. 67. After we had gone through two toasts, it was time to prepare the candidates. To paraphrase the words of our Grand Master, Tom McCarthy, what separates us from any other group is our ritual. It teaches lessons to our new brothers even if they don’t remember it all right there. I could see in the faces of all brothers those memories of our own initiation as well as the excitement and joy of our new brothers as they began their first step into Masonic light. It was great to see MWB Tom Jackson as well who is truly a great friend and mentor to Masons everywhere, including myself. His zeal and understanding of our Craft is, in a word, "marvelous." It was also great to see Right Worshipful Brother John Cook, our Deputy Grand Master, whose prowess for ritual proficiency is legendary. I will be honored come March to see such a dedicated brother be elected as our Grand Master for 2010-2011 (should tradition prevail) at our Grand Lodge Annual Communication, my final one as an officer of the Lodge. 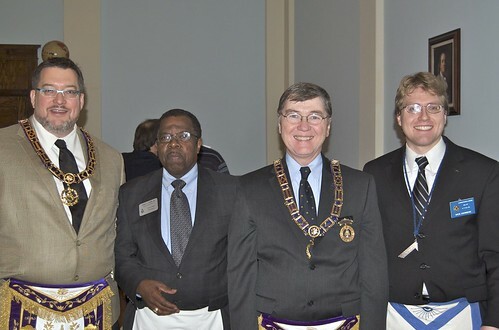 Seeing the three great light bearers in the state, the just was, is and will be Grand Masters of our state all within the confines of our Lodge hall was inspiring and I hope that our new brothers will understand the solemnity and importance of this meeting and our luck as a Lodge at hosting these three great Masons. We were also fortunate to have a Custodian of the Work, Bro. Foster of Minnehaha Lodge and a friend of mine and his, Bro. Greg from Accacia Lodge in Cottage Grove were also there to celebrate in this joyous occasion. As you can tell from my feverish writing, we had many things to do that evening but even with all of this, I believe the brethren, especially our new brothers, found an experience that was unique and memorable. Next meeting, we will present more education on the first degree. It should be enjoyable and if you would like to participate, please come on down to Farmington, our doors are always open to a brother. I have linked to the program that we used that can be found on the Grand Lodge of Minnesota's website. If you are Master or soon to be Master, I can honestly say, try it out. The brothers will love it. I'm proud to say that I have recently received my membership letter and dues card for the Philalethes Society. I'm very excited to see what I can expect from one of the premier Masonic research groups in the world. The Philalethes Society includes amongst its ranks some of the brightest minds in Freemasonry today. Included in the membership is a subscription to the Philalethes Magazine. 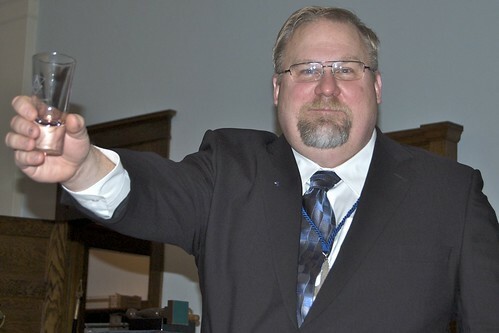 This magazine publishs influential and well-researched pieces about the subject of Masonry including the writings of WB Ed Halpaus, the Grand Lodge Education Officer of Minnesota. Minnesota is very lucky this year. This year, MWB Terry Tilton is the current president and Minnesota will be hosting the 82nd Annual Feast and Forum. Included on the program is MWB Tom Jackson, who will be discussing how we fail with college men and what we can do to win. I am very interested to attend this event. Tonight, my good friend and the Senior Warden of our Lodge, Steve, was installed as High Priest of Corinthian Chapter #33 and Companion Chuck was installed as Illustrious Master of Northfield Council #12. I will post pictures of the nights festivities below. I can say that Royal Arch, in particular, and York Rite, in general, will feel a new sense of rebirth as Masonry is once again discovered. Royal Arch Masonry offers to the brother something further in his Masonic life, something new. Perhaps a brother doesn't find something he's looking for in his mother Lodge. Although he has a duty to attend Lodge, he may feel that his talents aren't being used to their fullest. That's where the appendant bodies come into play. I really have enjoyed my time in Chapter, learning new ritual and witnessing degree work for the first time in four years as an actual candidate. I have opened a new area of study in my Masonic education. The best part of York Rite is its closeness in both locality and relationships with the companions in the local Chapter and Council. I hope that my soon-to-be Chapter and Council continues to have great success in the coming year and beyond.